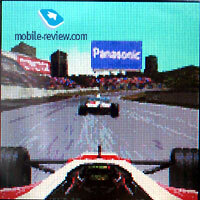 Panasonic G60 belongs to the second generation of phones with color displays category, and is a replace for GD67. It’s typical for Panasonic to release similar phones in one and the same category. You will notice common details not only with GD67, but with GD75 as well if you look at GD60. 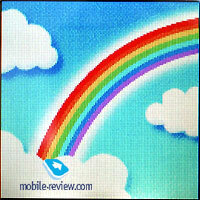 The similarity with GD75 was made possible because of the case’s monotonous color. 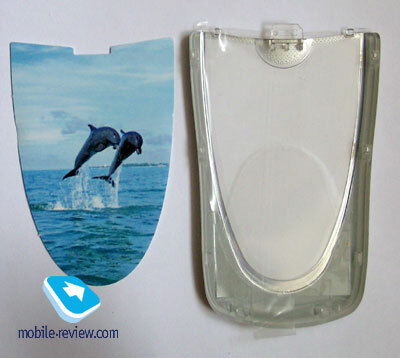 The battery cover is located on the phone’s back, it’s transparent, and has setting in inside. 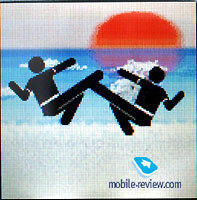 The phone is shipped with a special template that will make your process of creating new setting in much easier. 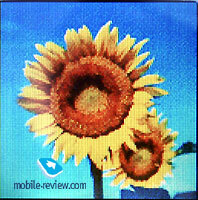 Three different pictures are shipped together with the phone as well. They have nor big difference, neither attractiveness factor. 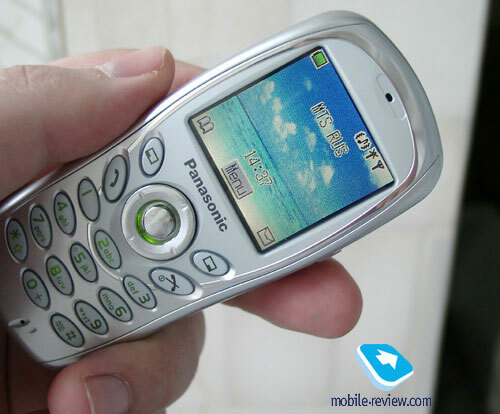 It’s a sad fact since Panasonic was first company that invented this type of the phone’s decoration. The model was GD67. 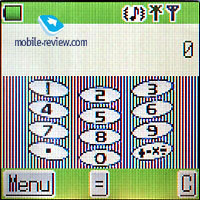 Nokia 3200’s setting in are a lot prettier and original. They are made on another, higher level. The plastic is a common thing between these phones; it’s very delicate and gets scratches all over very fast. 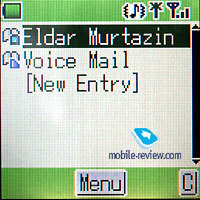 The display is traditionally located on the front side of the phone. 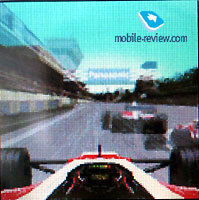 Physical size is rather big, however the resolution is 128x128 pixels. 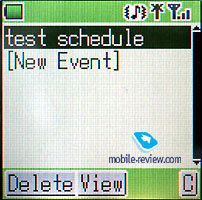 Six text lines and two extra lines for the service needs can be shown at once. The display is capable of showing 4096 colors (STN matrix), the picture looks properly, the color acutance is nice as well. The picture looks fine when it hits the Sun during winter; however you mustn’t expect the same when summer or spring will be around. It’s typical for STN screens to behave like that, so nothing new comes with this model. 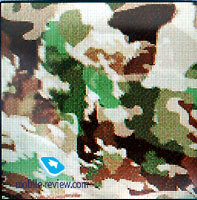 The picture will get hard to be seen, you will be forced to look deeply into the screen. Just look at the display when the backlight is turned off if you want to see its performance in summer. The Digital Clock is the only thing that’s displayed during the passive stand by mode. 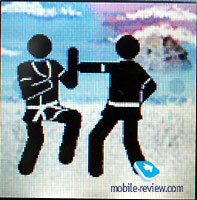 Talking about stand by modes – there’s also active one that features 4 animated images. The user can define the one he likes the most, and it will get activated after some idling; the backlight will turn on as well, and turn off instantly after the animation finishes. In my opinion this idea is not really interesting or useful since you probably won’t wait for some unknown period of time in order to see it. This feature will most likely get turned off after you will get bored of making experiments with it and showing this “magic” to your friends. Turning off the animation will save some battery power as well. If you use your phone often I’d recommend turning off the stand by mode completely, this will enlarge the battery’s life up to 6 percent. 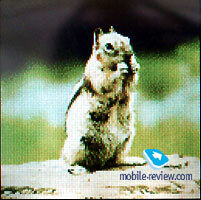 The backlight’s working time length can be chosen out of three intervals. 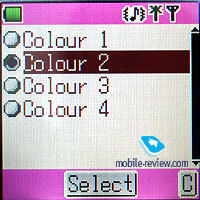 This means that the backlight will get turned off if you are not pressing any buttons and no process is running. The default setting for this parameter is 10 seconds, and is the shortest out of the three available intervals. 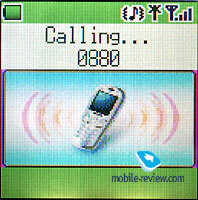 This setting is useful only if we’re talking about energy saving, however when you have an incoming call and it is dark around you, the display will be turned off by the time you will answer the call, so you won’t see the number. The statistics shows that usually it takes around 10-15 seconds in order to answer the phone, and as you can see the backlight will not be working by that time. Setting a larger interval will cause more energy consumption which is not good as well. 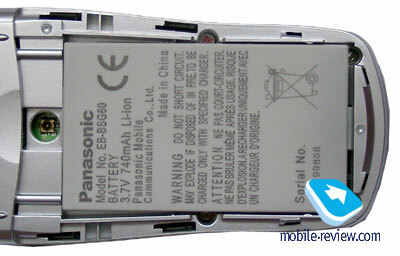 The phone has Li-Ion battery with 740 mAh of capacity. 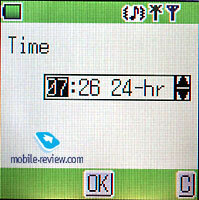 Panasonic claims that it can work for 4.6 hours during talking and up to 200 hours during the stand by mode. When we were testing this phone in Moscow it worked for 3 days with 25 minutes spent for talks and 15 minutes spent for other functions daily. 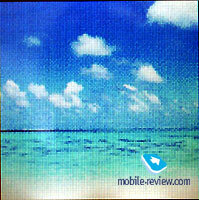 The backlight’s length was set to minimal parameter, screensaver was turned off. Charging up an empty battery takes about an hour and a half. Active users should be expecting not more than two days of work. One of the biggest disadvantages is the “low battery” alert. It gets activated 15 or 20 before the battery will get completely emptied. If you are talking at the same time when the alarm gets activated – the phone might turn off instantly. There’s no special reserve at all. The battery’s indicator will turn red when the battery is low, however the indicator itself is partly painted over, and that’s why sometimes it may seem rather confusing. 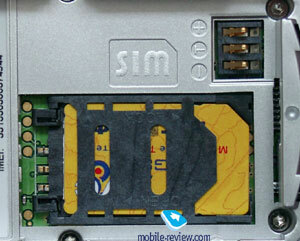 SIM-card holder is a typical one, nothing special can be said about it. The keyboard is made of plastic, buttons size is average, they’re placed nicely. Considering that a lot of recent mobile phone’s keyboards were made only for the design, this one doesn’t have any problems while you’re using it. It’s very comfortable; the keys are sensitive enough, so you won’t have to look on the screen while you’re typing. The keyboard’s backlight color is green; it’s clearly seen when it’s dark around. Standard handsfree adaptor can be connected; its port is located on the phone’s bottom and, covered with rubber cork. The interface connector is located near it, meanwhile the hole for strap is located on the top. The phone is comfortable on the whole, its sizes are typical - 104 x 47 x 19 mm, 85 grams, it offers a compromise between ultra-small and big phones. The weight is average as well. 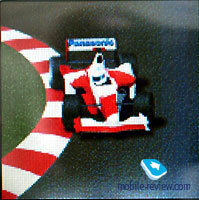 The menu can be accessed by pressing the OK button that is built-in inside the joystick. 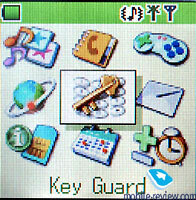 The main menu is presented with 9 icons formed in three rows. 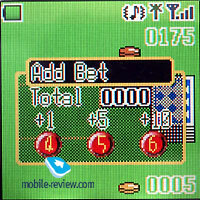 The fast shortcut number navigation is supported. The key lock icon gets highlighted by default; it’s one of the most demanded functions to be honest. Sub-menu is presented as vertical lists. 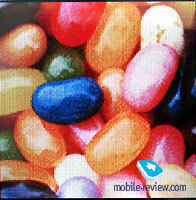 Let’s review the main features of this phone, shall we? Phone book. 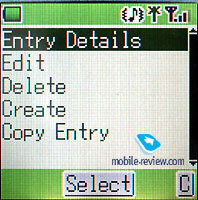 200 entries can be stored in phone’s memory, and only one number can be assigned for each. However you can also define e-mail address. The font changes when you input information and move between the fields, it’s made in order to make the input easier. Unfortunately when you’re editing the e-mail field the input type gets set to digits, this forces you to switch it back. Sometimes it may become annoying. Each entry can be bind to a group. 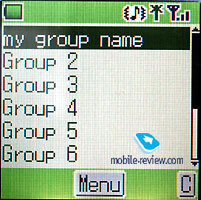 Custom icon and ring tone can be set only for groups, and not single entries. You can only assign a button for fast dialing, and that’s it. On the whole phone book’s features are poor comparing to Siemens M55 and Alcatel 535, these phones are targeted for the same segment as G60. The lack of preinstalled pictures or icons used for groups, and EMS/MMS messages is very disappointing. You will have to download these pictures manually via the WAP-browser, that’s not very convenient. On the other hand, more memory is available for your own pictures, although this can’t be really called an advantage. Messages. This model supports joined messages, EMS and MMS. Everything is rather simple and easy to learn. Text input with T9 support is not a problem. 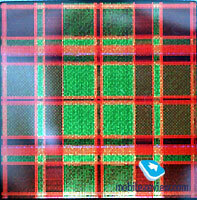 Ten templates are available, and can be customized as well. SMS-chat is present. 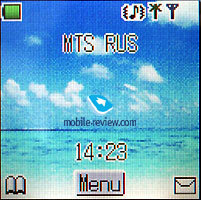 MMS messages are provided with dynamic memory, which is used for pictures/ring tones as well. 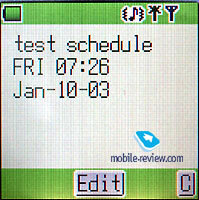 You can create several slides in MMS message; setting up relay server doesn’t bring up any questions. Settings. 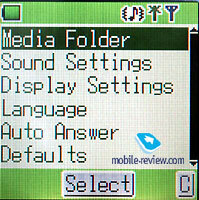 This menu has sub-folder “Media” in which all images and ring tones are stored. The “Sounds” sub-menu stores various customizable profiles that can be activated only from here. You can’t bring the profile menu up by pressing one or two buttons, that’s not really convenient. 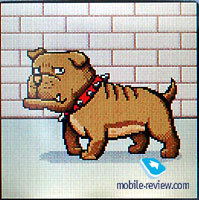 Although you can activate “Silent” mode by pressing one button, and that’s it. 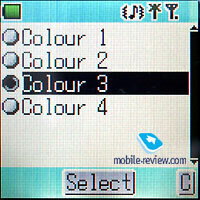 The phone features four different color themes for the menu. You can’t preview them though, so you’ll have to set it first in order to see how it looks. 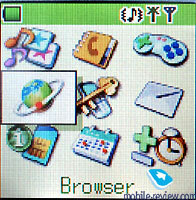 All settings related to the display are located here as well. Games. This phone has only one game installed, and it is Black Jack. Nothing interesting, and after a short while it gets boring..
WAP. Standard WAP-browser, nothing else. Applications. Duplicating the Games menu wasn’t necessary. 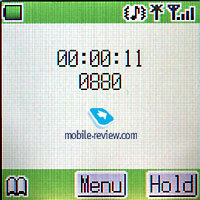 Dictaphone that allows recording one entry with maximum length of 16 seconds is located here as well. 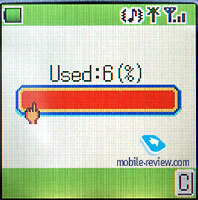 This entry will be deleted whenever you change the SIM-card. The Dictaphone worked only during the talking, but perhaps it was just the model that we were given, most likely the retail ones will work fine in both modes. Talking about the recording during the stand by mode – the indicator showed that the record is under way, however the file had never been found. 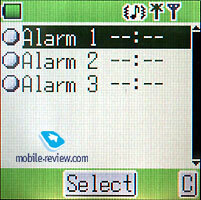 Up to three alarm clocks can be set at once; each of them can be set up for the required days of the week. The phone can be turned ON/OFF automatically according to the timer. Calculator is currency converter as well, simple and convenient. 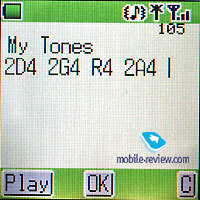 Ring tone editor is present, you are free to choose the notes and compose a melody out of them. No additional features are provided. Organizer. 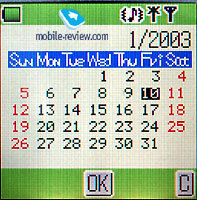 Calendar can be seen monthly only when you enter an occasion, that’s not always comfortable. No alert can be set for entries; I mean you won’t get reminded about doing something you wanted. Considering all mentioned above I don’t think that the presence of Organizer is more than an additional feature, that won’t be used much by the phone’s owners. Network receiving quality is awesome. The phone works great in the city. The vibrating alert’s power is average meanwhile 16 tone polyphonic ring tone is loud enough and we heard it in almost all occasions. We can’t say something special about this phone since it’s functions got reduced on purpose. This phone will be bought by those who need a mobile phone just for one thing – make calls. 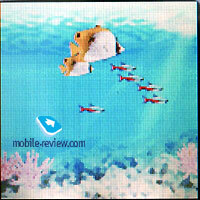 The number of additional features is not very high, and it loses against almost all its competitors. This model looks pale comparing to Alcatel 535, Samsung C100. Like I mentioned earlier, the lack of preinstalled pictures is one of the biggest disadvantages. I don’t think that every user will setup GPRS connection and surf WAP for wallpapers, or buy an additional external camera. 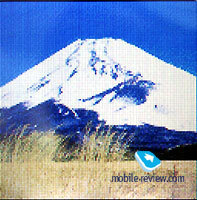 Talking about the camera – the photos quality will still be far from specially prepared pictures. 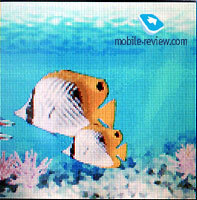 Loudspeaker’s realization can be brought to the phone’s advantages. It’s one of the best around the market. 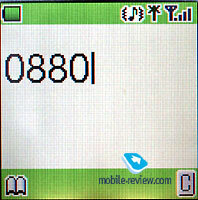 When you’re dialing a number the font increases so the digits are clearly seen. 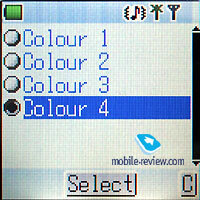 Only few manufacturers use this feature, mostly these are Samsung’s phones. Panasonic G60’s price currently is about 200 dollars. In my opinion those who already own a Panasonic mobile phone and those who like this company’s phones should take a look at this model. I want to make it clear, even not looking at the rather poor functionality the phone still leaves a nice impression; it does its main purpose flawlessly – providing you with the ability to make and receive calls. In case if you don’t belong to one of these two categories you should look for some other model instead because of the price and functionality. 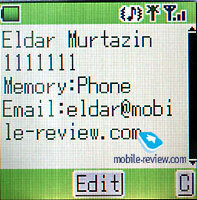 SAR level for this phone is 0.732 V/kg.